Denison University received a B.
Washington Monthly's ranking of 191 out of 224 of Affordable Elite Colleges - Overall Rank was a major contributor to this grade. On a beautiful campus designed by Frederick Law Olmsted, Jr. of the family that gave us so many of the nation's best urban parks, Denison University sits on a hill above the Ohio village of Granville. Having worked hard on its once-hyperactive Greek community, put a lot of money into merit scholarships, gone test-optional, and made efforts toward diversifying its student body, Denison is a worthy location for those willing to consider leaving the coasts for a quieter part of the country. In name a university, but in ethos a liberal arts college, Denison is one of the 40 campuses chronicled in Colleges That Change Lives. What is a typical Denison University student like? Describe the type of person that should attend Denison University. A Denison student should be hard worker who likes to get involved with the school He/she should also take up leadership positions and be a strong voice within the classroom. What are the top 3 reasons someone should attend Denison University? Small school, beautiful campus. Great interactions with teachers. It's SO MUCH FUN and you build great relationships.! What was a typical Denison University student like in high school? Describe the type of person that should attend Denison University. Has a middle-of-the-road to conservative student body, lots of preppies, and one of the most beautiful campuses anywhere. The 2,200 undergraduates manage to create an environment where they can work - and play - with plenty of variety. "The school "suggests" an interview, meaning you should do one if at all possible." Small classes with approachable professors. As one of the nation's leading liberal arts colleges, Denison University boasts generations of students who can attest to its effect on their lives. Each would cite a different reason. And they'd all be right, because Denison's liberal arts tradition and residential community create a college of endless personal possibilities. The outcome is an old term that we take for granted: "well-rounded." But consider what it means: Denison graduates have a voice. They can speak, write, listen, collaborate, innovate, take responsibility, solve, adapt, and lead. Americans change jobs, even careers, something like seven times during their lives--a number that seems likely to rise. The liberal arts' broad curriculum ensures that Denison graduates have studied across disciplines, so they are not narrowly trained in one field. And when the going gets tough, the tough get the best education and then go on to lead successful lives. What are the top 3 things that students do for fun at Denison University? Go to hosted events and parties, especially by and fraternities. Go out into the town of Granville. Go drive out to the mall of Easton. 30% of female students live in sororities. 100% of students graduated in the top quarter of their class. 39% of students graduated in the top tenth of their class. The average student pays $28,207 for tuition, fees, and other expenses, after grants and scholarships. Total stated tuition is $42,990, in-state and on-campus, before financial aid. Learn more about financial aid at http://www.denison.edu/admissions/financial_aid.html. Estimate the net price for you at http://www.denison.edu/offices/financialaid/consumer/index.html. 77% of students graduated on time. The typical (median) early career salary of Denison University graduates is $47,500, according to Payscale. Denison University participates in the NCAA Division III for college athletics. 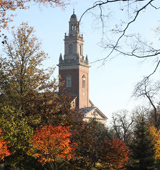 Want more info about Denison University? Get free advice from education experts and Noodle community members. How can I get more information about this university's club hockey team?